There is still some value left in buying energy stocks. Three that look appealing to us right now are National Oilwell Varco, Enterprise Products Partners, and ConocoPhillips. If you were buying oil and gas stocks in 2016, then congratulations. You picked the sector with four of the five best-performing commodities and the best-performing stock index for the year. 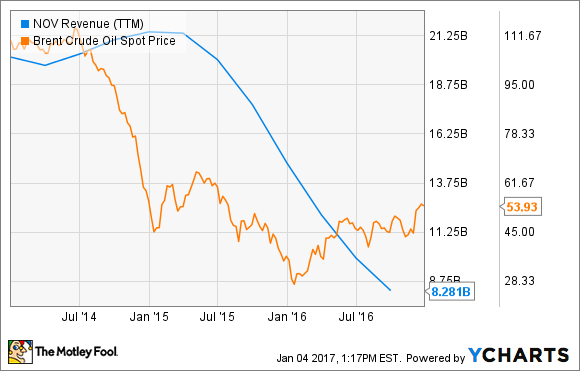 After such a great year, though, some investors might be wondering if there are any great buys left in the oil industry. So we asked three of our energy contributors, and their response was an all-caps "YES!" Three stocks they highlighted were National Oilwell Varco (NYSE:NOV), Enterprise Products Partners (NYSE:EPD), and ConocoPhillips (NYSE:COP). Here's a quick look at each, and why it is a worthy investment today. NOV Revenue (TTM) data by YCharts. In fairness, part of the decline was due to the spinoff of its distribution business as a separate company. But even accounting for the approximately $4 billion in sales that's now part of a separate company, National Oilwell Varco has seen its revenues fall sharply. Rig systems sales declined 67% -- more than $4 billion -- from 2015, while rig aftermarket sales fell by nearly half. Wellbore technologies and completion/production solutions revenue declined around 40% in 2016. Rock-solid balance sheet with over $1 billion in cash and low-cost debt. Excellent management, which has strengthened the business during the downturn through cost containment, acquisitions, and smart capital allocation. Despite GAAP losses, the company has remained profitable on a cash flow basis throughout the downturn. Its stock trades at a solid value today, with great long-term upside as the energy cycle turns. Bottom line: Global rig utilization rates have been at record-low levels for over a year. Combined with the decline curve of producing oil fields, this points to an upcoming inflection point, where a significant amount of investment in new equipment and parts will be necessary simply to support the world's demand for oil and gas. And when that happens, National Oilwell Varco shareholders could do incredibly well. Tyler Crowe (Enterprise Products Partners): 2016 set the stage for what we can expect to be a decent recovery for oil and gas investments in the coming years. From an investor standpoint, this is good news: Oil prices are starting to rise slowly, and the curtailing of billions of dollars in projects over the past couple of years lends itself well to much higher prices much further down the road. However, investors have been quick to jump back into oil and gas stocks, and in some companies' cases, valuations aren't as attractive as they once were. I'm not saying that the window for buying oil stocks at bargain-basement prices is completely shut, but it is closing a bit. One stock for which that window still looks to be open, though, is Enterprise Products Partners. Enterprise is probably one of the better-positioned oil and gas transportation and logistics companies out there. Its natural gas liquids pipeline network is unparalleled in the U.S.; it has one of the better-looking balance sheets in the business; and its management team has a long history of prudently balancing the needs for growth of the business, growth of its payout to shareholders, and growth of its debt load. That is how the company has been able to raise its payout every year since its IPO in 1998. If you are after a strong income investment, or one you can hold on to for a long time and let reinvested dividends go to work, Enterprise is definitely worth a look today. Growth with this company may never blow your socks off, but management has made a habit of increasing payout at a rate of 5% or more. Combine that with the stock's current yield of 6% and you have a pretty good investment to kick off 2017. Matt DiLallo (ConocoPhillips): Leading independent oil and gas producer ConocoPhillips has undergone a dramatic transformation over the past year. The company went from a producer that needed oil over $75 per barrel to sustain its operations to one that can run just fine at sub-$50 oil. With its transition to a low-cost producer now finished, the company's new focus will be on increasing shareholder value. To achieve that aim, the company no longer intends to spend beyond its means on growing production. Instead, it plans to use its reduced costs basis to generate free cash flow, which it will allocate toward reducing debt, increasing shareholder distributions, and modestly expanding production. These new priorities should deliver solid total returns for investors over the long term. Furthermore, ConocoPhillips plans to accelerate its value-creation efforts by selling $5 billion to $8 billion of non-core natural gas assets over the next two years. These sales will not only unlock value but will provide the company with enough cash to buy back up to $3 billion of stock and strengthen its A-rated balance sheet. Finally, the company should also benefit from an improving oil market in 2017. Not only are market fundamentals on pace to rebalance on their own, but OPEC has stepped to accelerate that trend. Needless to say, there are plenty of catalysts on the horizon that could drive ConocoPhillips' share price higher, making January a great month to consider buying this oil stock.